Monday morning brought the Opening Plenary, and I was confused. #imm12 confession: I totally Googled “plenary” this morning. It means “fully attended or constituted by all entitled to be present,” by the way, and the topic of ours was Toward an Understanding of Information Literacy as Personal Practice. Monday’s program also included Teacher Track 101, The Authentic Teacher & Bain, Teaching Techniques, meetings with faculty, and presentation practice. I liked what we did with the jigsaw activity. As each small group member presented to the group, the other group members wrote down two or three keywords from the report. For Ward, I wrote connections and curiosity; for Mackey and Jacobson, I wrote metaliteracy, context, and engaged; and, for Doyle, I wrote evolving, shifting, and responsive (I presented the Jacobs). After everyone had reported, the group recorded our keywords and their frequency of use on a Post-it wall pad sheet. A couple of faculty members then used the sheets to create a word cloud that served as a visual representation of the understanding of information literacy to which we had come as a group during the opening plenary. Reading and talking about Christine Bruce’s work. Before Immersion, I read The Seven Faces of Information Literacy, and, during the Opening Plenary, a faculty member shared Bruce’s words about an approach in which “teaching and learning information literacy would stress not skills acquisition but the growth of learners in coming to understand and experience information literacy” (Bruce, The Phenomenon of Information Literacy). Bruce’s work, along with the Jacobs article, were the first I’d seen that painted a picture of info lit different from the locate/manage/use information concept. Both Bruce and Jacobs emphasized that info lit is messier than our rubrics and definitions make it out to be and cautioned against reducing it to being about standards and teaching methods. Thinking about info lit in this way- not something to be mastered, but something with which to get messy- put me in the right head space for the week. Voicing- then letting go of- our fears. During the Teaching Techniques session, we were asked to illustrate our fears around teaching. As we shared our fears, it became apparent that my fears are not unique; my peers and I generally worry about being (or being perceived as) inexpert, irrelevant, boring, and/or uncool. I don’t have my drawing to share because of what happened next: I threw it away. Yes, it was hokey, but I dig ritual and symbolism and it felt really good to let go of my fears in order to learn and grow as a teacher. We finished up the day by practicing our teaching presentations. 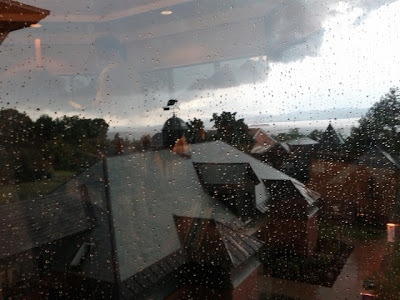 My group met in the Vista room of the Miller Information Commons, where I snapped this pic of a storm coming in from across Lake Champlain.